"Mixing and mastering are very different crafts, and each one of them needs 10,000 hours of learning to be good at it"
The limited edition Elton John Burberry boxset is available now. It would be hard to think of a more highly-respected and decorated mastering engineer than Bob Ludwig. His long and illustrious career has seen him work across multiple genres and formats, and seem him providing his services to everyone from Led Zeppelin, Queen and Jimi Hendrix to Frank Ocean and Daft Punk. 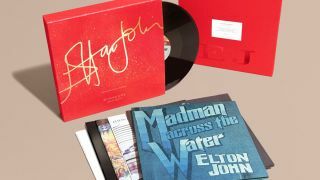 One of his latest assignments was to remaster six of Elton John's albums for a new limited-edition vinyl boxset that's been created in collaboration with Burberry. Having previously remastered the Goodbye Yellow Brick Road LP, Ludwig was called on to take a fresh look at Elton John, 17-11-70, Madman Across The Water, Captain Fantastic And The Brown Dirt Cowboy, Too Loo For Zero and Songs From The West Coast. How did you get involved with the mastering of the Elton John albums, and did you have any reservations about touching what, in some cases, are considered to be classics? "When I got the call to remaster Goodbye Yellow Brick Road and then the subsequent remasters I was deeply honoured. These are indeed classics, and I gave them a lot of respect! "In the past they were originally mastered for vinyl and cassette and, later, compact disc. For me, the goal of remastering these iconic albums in high-resolution digital for the future was to make them sound as good as I possibly could, yet paying close attention to the sound of vintage LP copies of the originals that we know were definitely approved by the artist before their initial release. That was the best pedigree for a reference." Do you think it's more difficult to remaster an existing album that everyone knows than it is to master a new one, or vice versa? "It's harder to master a new album because there is no 'pre-approved' standard that everyone liked at some point (as the remastered albums have). Working on a new album means hearing the raw mixes and then hearing in my head how I think it should sound, and then knowing what gear and knobs to use to make it sound that way in real life. Thus creating something new from nothing. It is also important to determine what direction the artist wants to take; do they want lots of dynamics, or do they want it crushingly loud, etc?" "Often, a good mastering engineer can take the original mixes, on which the artist and producer had worked very hard, and come up with a sound that is literally transformational; something the producer may not have believed possible. Those are satisfying sessions!" "Remastering a catalogue album has different issues. One can buy a copy of the originally-issued LP and hear how it was first envisioned by the producer and the artist and know that sound was once approved. As our gear is definitely better than what was around for vintage LPs, one has to decide just how much 'better' is good, or perhaps if it should be left alone. There are a lot of variables. But at least one starts with a pre-approved musical direction, not the unlimited plethora of choices one has when approaching a new album for the first time. Often, a good mastering engineer can take the original mixes, on which the artist and producer had worked very hard, and come up with a sound that is literally transformational. "Also with remastering, one has to be sure that the master tape supplied for the project is in fact the right one, and that it is an original and not a second-generation copy. Also, if it was 1/4-inch tape, it is important to analyse what type of record head was used so the proper replay head can be used for maximum fidelity. Knowledge of what gear was available to them back then is also important." The Elton John albums you've remastered all come from different eras - does that mean that your approach had to be different for each one? "Not really. When I get to hear the raw, unmastered original mixes, sometimes they are very similar sounding to what was released; other times they did a lot in the mastering and went in a very different direction. So sometimes a record is extremely difficult to beat and other times it is much easier." "Some of the recordings had a lot of level changes within a song on the final LP that were not done in the original mix, so that requires a lot of comparison between the original master and the LP to see exactly what was done and to try to match it because we know that, when it was first released, that was what was wanted. All the fans would know it was 'wrong' if it wasn't corrected." Did Elton have any input on the remasters, or were you given free reign to do what you wanted? "I did what I thought was my best shot, and then Elton listened and made sure it was good. On one of the albums it was decided I needed to lessen some sibilance problems. A case of making it right for 2016 and ignoring that it wasn't done before!" Many bedroom producers now master their music in the box using software. Do you think that you can achieve professional-sounding results in this way? "Mixing and mastering are very different crafts, and each one of them needs 10,000 hours of learning to be good at it. Mixing engineers are not used to the minutia that mastering engineers are used to. "So, while one can get professional-sounding results, one has to know what one is doing! Usually, mastering in the same place that was used for mixing the album is uniquely the worst place to master a record, because all of the foibles of the room and speakers won't show up to the engineer and thus won't be corrected." Usually, mastering in the same place that was used for mixing the album is uniquely the worst place to master a record. Do you have an opinion on automated online mastering services such as LANDR? "Services like CloudBounce and LANDR are exactly that - automated! They are single-track orientated, not album-orientated. They will make every track loud even though the album needs overall dynamics - it should not be that way. There is zero overall vision for a project. "Often, it seems the results I have heard tend to put a 'smiley curve' on everything, adding more top and bottom and less mid-range. "There is no interaction with the client about what the artistic intentions of the project are. The worst part about them is that their algorithm is programmed to always do something to the sound. It isn't like a human engineer who can hear a fantastic-sounding mix and say 'you've done it perfectly, there is nothing for me to do to it.' The algorithms refuse to leave it alone, or tell you how good your mixes were in the first place." Ultimately, how much does the quality of a final master depend on the gear you've used, and how much on the knowledge and skill of the person doing the mastering? "It is primarily the skill and years of expertise that make the difference. The choice of gear is very important - without certain pieces of gear, one just can't do the job - but handing a pile of that same gear to a novice will not usually achieve very good results!" Finally, if you could give our users one piece of advice when it comes to mastering their music, what would it be? "If you can afford a professional, go for it. As a producer and/or artist, you have had your head buried in your music for a long time while making a record. Someone hearing it with fresh ears can really see the forest for the trees. Years of experience can make your project sound as though you had a much bigger budget! A pro can bring the maximum musicality to a project and master it at the sweet spot where the correct balance of detail versus impressive level lives." The Elton John boxset is available exclusively at Burberry stores across Asia, Europe, Canada and the US and at the Burberry website.